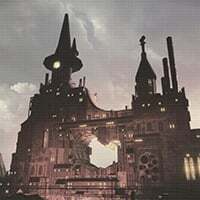 Tattered Pamphlet is one of the information archives in Nier: Automata. Pass through the gates and step into a world of fantasy before enjoying a fabulous parade put on by our carnival cast! *Parades are held twice daily, at 2PM and 6PM. How many of the ghosts that stalk these back streets can you track down? Soar through the air at over 130 kilometers an hour in this wlidly popular attraction! This dynamic thrill ride takes guests on a wild trip around a spectacular fantasy castle. It's the first roller coaster ever created with NO SEAT BELTS! Tempt your taste buds with a host of restaurants that feature something for the whole family. And remember, no trip is complete without a visit to our world-famous Hot Dog Museum, which boasts the largest collection of wieners anywhere in the world! Amusement Park - Locked Chest: Located near Park Ruins: Attraction Sq, at the foot of the broken thrill ride.